I sometimes joke that, when I die, my loved ones can take my ashes Downtown and drop them into the East River, at the foot of the Brooklyn Bridge. Brooklyn, especially the part I call Black Brooklyn, is in my soul. My ancestors began arriving in this broken land, Breukelen, in the late 1890s. They came from the lovely Caribbean island called Nevis and settled in Downtown Brooklyn, where many high-achieving blacks were establishing churches of various denominations and purchasing homes. There lived my great grandparents and great uncles and aunts, along with other brown strivers, like the Mortons, including Dr. Verina Morton (Jones), a physician, and Franklin Morton, her son, a lawyer; as well as others like the extraordinary scholar W. E. B. Du Bois, whose wife Nina would visit my Aunt Frances Baker, who lived her husband Uncle Ned, in their brick home on Lawrence St., a rock’s throw from the then relatively new Brooklyn Bridge. That community bustled with churches. One of them was the Ebenezer Wesleyan Methodist Church, started by my great-grandfather, the Rev. Alfred B. B. Baker. There were so many others, like St. Augustine’s Episcopal Church and Bridge Street African Methodist Episcopal Church. And they still exist. 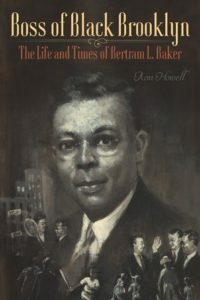 But over time, the black up and comers of Downtown Brooklyn began moving measuredly eastward (“uptown” as they used to say, though there was nothing “up” about it). The neighborhood where they congregated came by mid-twentieth century to be known to known as Bedford Stuyvesant. Later in the century, black Brooklyn expanded outward with the growing crush of migrants from the South and the Caribbean. The churches stayed alive, even as they shifted locations with their congregants. Recently, on Oct. 30, scores of Brooklynites, many with memories of black Brooklyn as it existed mid-twentieth century, gathered at the Greenlight Bookstore in Prospect Lefferts to celebrate the publishing of “Boss of Black Brooklyn.” Tears were shed as memories were shared, not just of the late Bertram Baker, but of a time and place that long-time black residents of Brooklyn now see to be disappearing. The Community Board that covers Bedford Stuyvesant, Community Board Three, has circulated recent Census data showing the percentage of whites in Bed-Stuy increased by 1,235 percent between the years 2000 and 2015. The black share of the population dropped by 17 percent. Every black person with close connections in Brooklyn knows that black flight has been picking up speed. Many of the remaining ones are angry. Don’t get us wrong. Change can be a good thing. In the case of central Brooklyn, the change, yes, known as gentrification, whistles temptingly at lovers of espresso coffee and the fine pastries that go with it. The streets are safer, in part because city and police officials pay more attention to the well-being of new residents. But the remaining black Brooklynites – the ones who haven’t yet fled to North Carolina or Florida – know that a rich part of Brooklyn’s soul is being taken from it. Take my buddy Richard Maxwell. At a gathering of old neighborhood folks last year, Richard stood front and center with his buddies at a microphone and they belted out old acapella doowop songs. Talk about tears coming to eyes. Some like Richard have homes here and are too stubborn to leave their Brooklyn. Some of the determination is righteousness. I, and I believe many of them agree, see evil and likely criminal behavior in the way Brooklyn is throwing up new buildings and tearing down old ones. One case in point is the old historic Crown Heights church, called St. Ignatius, that sat right next to Medgar Evers College, a mostly black institution in the city’s public university system (CUNY). Developers came into the neighborhood several years ago and tore down that century-old Roman Catholic church. City officials say the developers had every right to do that – even without getting permission from the city and even without giving notification to the local Community Board. Every time I tried to find out about the owners of that development company, all I could come up with was an LLC. We all know now that LLC’s (Limited Liability Companies) were created to hide names of money-people behind projects like that one. Go around Brooklyn. LLC buildings are popping up all over the place. I love the blues and I love old doowop songs. But one piece that rings with tender favor in my ears is from the gifted Canadian musician Neil Young, in his “Hold You in My Arms.” He bemoans “new buildings going up” and “old buildings coming down” and he admonishes us about the need to “hold on to something in this life.” Like me, he sees “gangsters . . . with their crimes” who are “blowing up . . . the old neighborhood.” And he recognizes that the “older generation” has “something to say.” His warning is that “they better say it fast, or get out of the way.” Richard Maxwell and I, and countless others, will find ways to say something and we’ll say it fast. And we’ll be true to the old boast said by so many residents of Bedford Stuyvesant back in the day: Bed-Stuy, do or die. University of Manitoba Press, Syracuse University Press, University of Georgia Press, Northwestern University Press, University Press of Mississippi, Temple University Press, University of Alberta Press, University of Texas Press, University of Washington Press, Johns Hopkins University Press, University of Illinois Press, Rutgers University Press, Oregon State University Press, Columbia University Press, and University of Toronto Press.